A deck-building game that is (allegedly) often compared with Magic: The Gathering. As a point of note, I actually tend to avoid "card-collection" games as they require too much investment and time. However, there are always exceptions to rules; Dominion is a fairly good one and has much strategic depth for a group of 3 to 4. You don't need to collect all the cards from the expansions to enjoy this game; the base game will do. Expansions: There are plenty, each containing around 150, 350 or 500 cards to supplement the original. 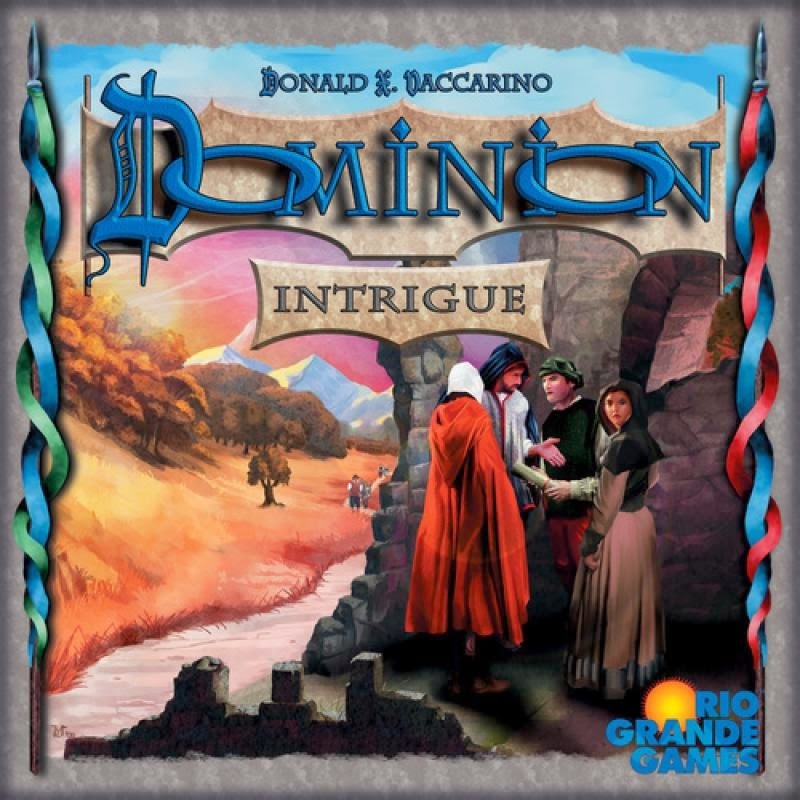 The exception is Dominion: Intrigue, which is a standalone game. However, if used with the original game, it can play up to 6 players, which isn't always desirable. Each expansion is based on a different theme and gives cooler cards with more powers. There is also a Base Cards "replacement" pack that has 250 cards that gives you all the basic treasure, victory and curse cards. Time to play: Apparently at least 30 minutes+. Can take much longer if playing with new people who aren't good at deciding. Price Range (AUD): Quite expensive given that it's only a set of 500 cards!! Cheapest copy is about $49 (pick-up; there is a site that sells it for about $44 now as I write this, but this is not including shipping and it's on sale). On average, if you order it online the price will be between $62 to $79 including shipping. You are basically paying for shipping the weight of a regular-European sized box that acts as a storage box for all the cards. But the box is useful as the sections that hold all the cards are labelled. Still not really worth it though because of the expensive shipping if you ask me, at least for us here in Australia. Availability: As it's quite well known, it should be in established hobby game stores and online. "Make your deck as efficient as possible"
This is a pretty nice game. The only problem I have with it is that you often get this effect where "everyone is doing their own thing" and it becomes quite hard to follow what everyone is doing on their turn - especially in the more advanced stages of the game where everyone has powerful decks of cards. In other words, there is little to no accountability in terms of checking whether a player, on their turn, is strictly adhering to the rules of the game. But, to be fair, this isn't so much of a problem if everyone is conscientious and doesn't mind being a little more attentive to what someone is doing on their turn. A little context might help you understand my concern with this game. This game is a deck-builder in which everyone builds their own deck of cards (which represents their respective dominion or kingdom). That is, all players vie for the best cards from a common pool of cards available to everyone. On your turn you draw 5 cards from your deck. You then play whatever you can (action cards, or coin/treasure cards to buy better cards), discard the rest of your hand, add the newly purchased card into your deck, and draw more cards. This procedure can be hard to follow at first but you will get the hang of. Soon, the cards you've just acquired form part of your deck and your deck becomes even more powerful. The other smaller problem I have is that the game can take a long time between turns as each person tries to decide what they do with their deck of cards - this becomes quite apparent towards the mid-to-late game where everyone has purchased powerful cards that give them extra actions and money. It is hard to track what everyone is doing without taking up a whole lot of time and discussion. However, if you play with the right group of people (those who know the rules very well and don't mind waiting for each player to take their turn - either because they are patient or because they take interest in other people's turns), this game can be quite fun. It also helps to have played this many times before so that everyone is familiar with all the cards and their abilities. On the upside, there is quite a nice dimension of strategy to this game. If you go for cheap victory cards too early, you will clog up your deck as they are pretty much worthless in terms of helping you obtain more (and the better) victory cards. If you try to make your deck too efficient (by obtaining gold coins and powerful action cards), you may narrowly miss out on the best victory cards if you get your timing wrong. The tension as each player tries to get the best combination of cards makes for a good game. There are also different combinations of cards that may prove to be effective. * September 2014: Personally I think this game may deserve a higher score, but I feel that the nature of this game (deck-building) is such that people won't necessarily latch onto the game. Thus giving such a score may be deceiving, to say the least. There is just so much strategy waiting to be explored, especially if you play the game with different combinations of cards. Interesting gameplay and strategic depth - there are a numerous array of strategies you can undertake: be aggressive; stock up gold; maximise certain combinations of cards. The theme of being a monarch seeking to conquer lands is also pretty interesting but not felt that strongly - you can only feel so much of the imagination from a set of cards! "Everyone does their own thing" --> on a player's turn it can be hard to keep up with what people are doing, especially with counting how many actions and buys they have left. Counting actions, even out loud (as the game recommends), is confusing for me. If you like the idea of a deck-builder game, where each player vies with others over a common pool of resources and tries to make their deck the most powerful, give this game a go. The goal of the game is to have the most number of victory points in your deck when the game ends. any 3 piles of cards are empty in the supply area. Starting deck: Everyone gets a personal starting deck of cards of 7 Copper coins and 3 estate (victory) cards - this represents their dominion. This is shuffled and everyone draws 5 cards. The left pile is the starting deck. The 5 cards next to that are the hand drawn by this player - 3 coppers and 2 estates (the player can keep their hand a secret). Not shown by this picture, to the right, is the player's discard pile (which is empty at the moment). Supply area: All 3 treasure piles (Copper, Silver, Gold); 3 victory card piles (Estate, Duchy and Province); 1 curse pile; as well as the trash pile card are placed in the middle where everyone can access it. Before I explain gameplay, it's important to remember, as I've said in an above picture, that everyone has their own deck and personal "discard area". The discard area is on your far right - it is used to put not only cards you have played (including Action cards and Treasure cards) BUT ALSO cards that you have just purchased. Play ONE action card, unless the action card lets you perform more actions. Once the action phase finishes, you can't play any more action cards until your next turn. You can buy anything from the supply, so long as you have enough money to buy it. You can play as many treasure cards (not action cards) in your hand of 5 to do this. The newly purchased card goes into your personal discard pile (the right side below). All the cards you played to purchase the card also go into your discard pile (again, on the right side below). Note that estate/victory cards can be used to purchase things. How this works is that they can be permanently trashed/destroyed for a one-off purchase, if you use the Remodel card which lets you trash a card to get something worth 2 gold more. Estate cards are worth their cost (in the bottom left corner). Hence, if something costed 4 gold, but you didn't have enough gold to pay, you can still get the card worth 4 gold by trashing one of your estates (worth 2 gold, + 2 because upgraded). For example here, remember the starting hand of 3 coppers and 2 estates? Suppose this player pays 3 coppers to purchase the Workshop card. What happens is that the 3 coppers are placed on the right, which is your discard pile (representing payment for it). The remainder of your hand (unused or unplayed cards) also goes into your discard pile. If you have no more cards left to draw, shuffle your personal discard pile to form a new deck, and draw from that. Following on from the above example, the remainder of this player's hand (the 2 estate cards) gets discarded as well. 5 more cards get drawn from the deck on the left to make his hand. The right discard pile can be reshuffled now to make a new deck, to be placed on the left. This deck now includes the newly purchased card. I won't bother explaining the effect of every card as that would be ridiculous - there's just too many to explain. But here are the Smithy and Remodel cards just to give you an idea - you can see they each cost 4 gold coins (the number on the bottom). The Smithy card allows a player to draw 3 more cards. The Remodel card allows a player to get rid of (trash) a useless card and upgrade it to something worth 2 more than the trashed card. Militia + Market. Cant go wrong! Haha, you always win. You are admittedly very good with games though.